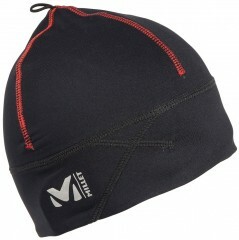 Designed for either touring or skimo racing, the aptly name Millet Beanie is a strong contender. A stretch-knit construction with quick-drying fibers is just want you want on your head when you’re fighting external cold and internal heat. The lightweight, tight-fitting beanie fits under a helmet and breathes well. The brushed lining and flatlock seam make it comfortable to wear. The Millet Touring Racing Beanie is a high-performance head piece for cold weather. On warmer days, check out the matching headband. 4-way stretch fabric is stitched with flatlock seams and a hi-vis logo. 87% polyester, 13% spandex blend is lightweight and breathes. Okay, so it's just a hat. How excited can anyone get over just a hat? This arrived as a product donation from Skimo Co for a skimo race series. I tried it on out of curiosity ... and immediately started scheming for a new award category that I could win! Seriously (though all that really was serious), although this is a basic beanie in outward appearances, it has a more complex construction than many most basic-looking beanies, and hence fits better (especially for staying put). So it's slim enough to go underneath a race helmet, yet also fits well -- and looks good -- for walking around, nordic skiing, etc. Being bestowed the hat by the race director (i.e., myself) as the winner of the "fastest 50+ racer in top ten" award.